Seven pioneering female doctors are to be remembered at a special event on International Women's Day. The Royal College of Surgeons of Edinburgh (RCSED) is to unveil a plaque commemorating the medics' achievements at a ceremony in the city on Thursday. A defining moment in that campaign was The Surgeons' Hall Riot of November 18, 1870, which attracted widespread publicity and created a groundswell of support for their fight. Information on the University of Edinburgh's website reveals the challenges faced by the women at the time. The article states: "The everyday jealousy the male students exhibited was vile. "The men made life as difficult as possible for the Edinburgh Seven, shutting doors in their faces, howling at them and behaving aggressively. "Events came to a head at their anatomy exam when several hundred male students pelted the women with mud and other objects as they arrived. The women struggled through the crowd until a supporter unbolted a door to hurry them inside. "During the exam, the rioters shoved a live sheep into the hall, causing further chaos." The notice, part of Historic Environment Scotland's commemorative plaque scheme, will be officially revealed by Caroline Doig, a retired paediatric surgeon and the first woman to be elected to the RCSED Council in 1984 and the first female chair of the General Medical Council. She said: "Today, the college celebrates the role of women in all its committees and activities, and its growing female membership has reached over 5,000 surgical and dental professionals worldwide. 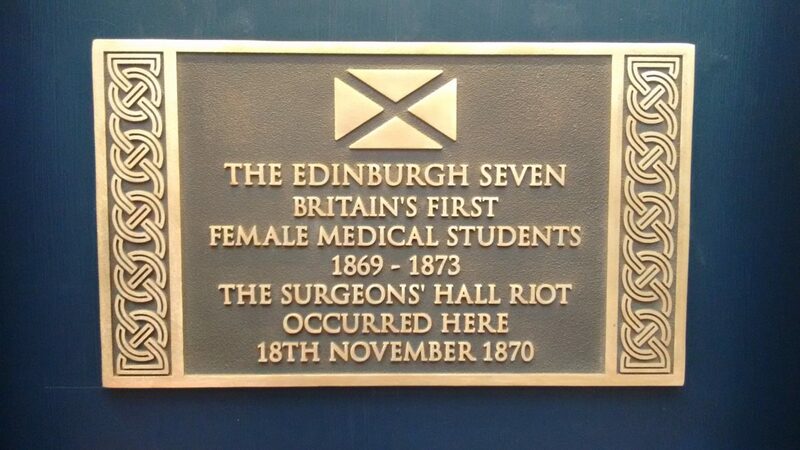 "I am delighted there are now so many women pursuing a career in surgery and it is an honour to unveil this commemorative plaque on International Women's Day, in memory of the first seven women to be admitted on to a degree programme at any British university."